A great friend of mine is a successful actuary who helps companies with defined benefits. Most of his family members don’t even understand what he does, so I decided I would explain it to them since I understood exactly what he did (since I asked him like a million questions). While explaining, I turned to the web to find more information, and below is what Purdue University has to say on their Department of Mathematics website. An actuary is a business professional who analyzes the financial consequences of risk. Actuaries use mathematics, statistics, and financial theory to study uncertain future events, especially those of concern to insurance and pension programs. Actuaries may work for insurance companies, consulting firms, government, employee benefits departments of large corporations, hospitals, banks and investment firms, or, more generally, in businesses that need to manage financial risk. A career as an Actuary is better described as a “business” career with a mathematical basis than as a “technical” mathematical career. Actuaries describe their work as challenging and interesting and generally enjoy a good working environment. 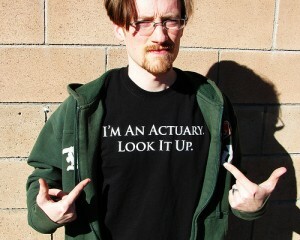 The Jobs Rated Almanac has consistently rated “Actuary” as one of the top two or three jobs on a variety of factors. (To check the current rating, click The 250 best professions.. ) According to several studies, the profession is more open than others to women and members of under-represented minority groups. Actuaries are in high demand, with starting salaries ranging from $45,000 to $55,000. The salary increments are based both on experience and exams passed. The increments can be quite large and may actuaries earn in triple digits. Most “well qualified” graduates (i.e. those with a 3.2 GPA and one exam) receive a number of job offers. To become an “Actuary”, you must become an Associate, and ultimately a Fellow, of one of the professional societies by passing a series of examinations administered by them. The largest of the professional groups is the Society of Actuaries (SOA), the organization for actuaries working in life and health insurance, employee benefits, and pensions. The Casualty Actuarial Society (CAS) is the organization for actuaries working in automobile, fire, and liability insurance and workers’ compensation. The American Society of Pension Actuaries is the organization for actuaries working in the pension field, in particular, those actuaries who certify to the federal and state governments that pension plans are sound.